When setting your garden apart from others that may exist in the neighborhood or just doing something different than you have done previously, a good place to start is by breaking up the garden with new color and foliage. Where flower arrangements can bring a touch of contrast in a garden one way to compliment the look of a nice flower arrangement is to compliment it with a small tree. One of the most colorful and unique trees you can add to your garden is the Acer Palmatum dissectum tamukeyana, or weeping Japanese maple. The following article will briefly explain some information on this plant and how to care for it. The weeping Japanese maple is categorized as a medium sized tree or large shrub which generally reaches a height of about 8 ft with at maximum a 12 ft spread. The leaves are shaped in a lace pattern and are colored in a purple hue during the summer months turning red towards autumn. Because of this colorization and massive change in color throughout the seasons this tree is perfect for accenting your garden and adding color to your flower arrangements. When caring for a weeping Japanese maple one of the top concerns for owners has to do with the climate the tree is in. This species of tree does not do well in temperatures which reach less than negative 20 degrees Fahrenheit. At this temperature the tree will very quickly die off. Instead the weeping Japanese maple thrives in warmer temperatures. During colder snaps and when exposed to frost and cold winds, it is always a good idea to wrap this species of tree in order to preserve its health and leaves. Be sure that it is planted in such an area where it will not be exposed to excessive amounts of cold. As well the tree should be planted in indirect sunlight as it can dry out quite quickly if placed in direct sunlight, indirect sunlight is especially important as the tree is settling and in the early stages of growth. One of the most interesting characteristics of the tree are its long lasting leaves. Although the colors will change with the season, the weeping Japanese maple is one of the first trees to bud and bloom in the spring, as well it will be one of the last trees to lose its leaves during the colder months of winter. With such a long lasting life of the leaves it is sure to provide color for your garden long after many of the plants die off and before annual plants have a chance to bloom. The weeping Japanese maple is a lovely addition to any garden, providing it with lots of color, while remaining small and manageable as to not completely take over the garden itself is a huge advantage to getting one of these trees. With the correct placement and in the right type of climate this tree is sure to thrive and provide your garden with a look which is very unique. I have a red lace weeping japanese maple. Last week it got down to 27 degrees for several hours, and I had neglected to cover it. Now the leaves are wilted and barely hanging on. Will this tree die. It is a lovely specimen about 7 years old. I would hate to lose it. What do I do now? Thank you for your advice. Sherry, there’s really nothing you can do and by all means do not fertilize your tree or do anything to attempt to save it. It just needs time. More than likely it will make new buds and produce new leaves. I tried growing japanese maples here way up north, no luck, any suggestions! MIKE-I HAVE A WEEPING JAPANESE MAPLE THAT IS TOO BIG TO MOVE TO OUR RETIREMENT HOME BUT WOULD LIKE TO HAVE A START–HOW CAN I GET A START FROM THIS TREE? Jackie, that’s going to be difficult. They are normally propagated via grafting which is tricky and you have to have a seedling to graft to. At http://freeplants.com I’ve got a page with details instructions about grafting. I live in Rochester, Michigan. I just bought a “Red Dragon” weeping japanese maple. I was told that this variety can take full sun. Would you agree? Tina, yes, as long as the plant is not tiny it should do just fine in the “Michigan” sun. Alabama would be a different story! If I try grafting laceleaf maples on rootstock, how tall should the rootstock be? Will the rootstock continue to grow vertically or will just the grafted portion continue to grow? If these trees produce seeds will they be the rootstock or grafted tree seed? I enjoy your videos and information you provide. They have been really helpful. I have a burning bush I need to trim but have been afraid to trim to much until I saw how far back you trimmed one. Denny, some people graft at ground level, others graft up about 18″ or higher. The rootstock won’t get taller, but it will produce suckers that need to be removed. Seeds would be from the desired variety since you will be removing any growth coming from the rootstock. I would love to buy one of the “Waterfall” Japanese maples. I live in a gated community near San Diego and have a number of Japanese Maples in my very small yard. I would like to have one or two Waterfall maples to complete my yard. I’m an 81 year old man who needs to complete his yard in a community that is a senior community. We have very small yards so I’m not in a positon to sell Japanese Maples. Plus, I’m too old to start selling now. Could I buy a small Waterfall tree that I can use to complete my yard? Can I buy a Japanese maple without sending in or joining your group? I love the Weeping Japanese Maple and the other one’s too. I Live in Jacksonville, Florida. I wanted to know if I can grow it here beings the weather is mostly hot. and I’d like to know how can I order off of your site. I have a couple Japanese maples that need shaping and pruning. They are about 15-20 feet high. How can I find a reliable person in San Diego to prune my trees? I have a Japanese maple that has a 4-5 inch truck. It was damaged by a contractor and he was trying to pay me for a replacement since I can’t find one. He offered $400 but I’m pretty sure it’s going to cost more with installation. Can you give me any thoughts? I can send you picture as well of needed. Tamukeyama is the type of Japanese maple. Please help ASAP? I’m in michigan. I recently planted two of the wheeping Maples in my front yard which faces North in Covington Louisiana. The trees are about 4ft. young. Approximately one month after planting, we had 23 degree weather two nights in a row. I covered the trees with sheets but ice formed on the sheets, freezing the leaves. My maples are now bare. While I will wait untill spring to see what becomes of the maples, I would like to know if it is typical for this variety to loose leaves in the winter months? I would like to buy or get an insurance quote for a weeping japanese maple (at least 5 feet or biger). I need it before Oct 13. I have a court date against a com[pany that cut my beautifull huge weeping japanese maple. The judge is asking for a quote. Please help. I live in Detroit, Michigan Area. I have a beautiful weeping Japanese Maple in Oregon. We just bought the house but it is over 5 feet so I’m guessing it’s pretty old. The previous owners cut a big douglas fir so the area gets more sun in the summer but is irrigated. Last Fall and Winter it was red. It turned green and looked healthy all summer. We had a very wet September and then warmer than usually October. In the last two weeks, the tree has gone from green to orange to red and now brown and withered and dropping leaves. It’s raining the usually Oregon light rain, so the roots are not dry. There are some mushrooms growing under the tree. I’ve noticed some neighbors trees are having the same issue but not as bad. Do you think it’s just the unusual weather or do the mushrooms signal a problem? The trunk and branches are not dry and brittle. The mushrooms are probably just a product of wet mulch, that’s pretty common. At this point I wouldn’t be overly concerned. As long as the area is not too wet the tree should be fine. Too wet would really be the thing to be concerned about. I have a weeping Japanese Maple and the very tips of the leaves are turning brown.. What does the tree need. I live in western Ky. It was beautiful and now this. I have only had it 1 yr. Please help. At best all in needs is water bu not too much. 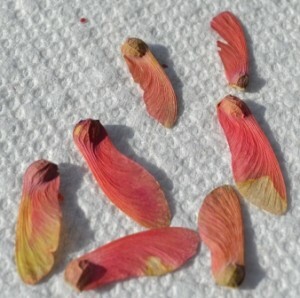 It’s not unusual in hot dry weather for tips of the leaves to turn. Probably would have been happier with some shade but don’t move it until Thanksgiving. How far away should I plant this kind of tree from the house? want to put it right in front of a window. And will it do well in Taxes? We do have 100 degree summers. Realistically it should be about 8′ from the house, 5′ bare minimum. Texas? That would be very challenging for a dissectum Japanese maple with no shade.